JOHN ROGERS. 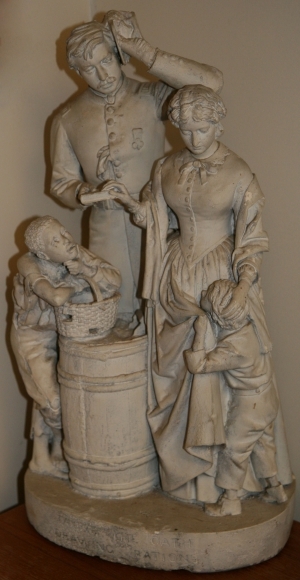 Painted plaster sculpture, “Taking the Oath and Drawing Rations,” on front of base; “Patented / Jan 30 1866” on rear. Base measures 8.5 x 13 in., height is 23 in. A very popular sculptor of American genre scenes, John Rogers (1829-1904) created what came to be referred to as “Rogers Groups,” many of which depicted Civil War figures. Professional repair to soldier’s upraised hand and minor peeling paint.